PB: Can you now please introduce us to Mr. nr. 082? SN: Ehm. Yeah! Where to start? He is a scan from a project called CAESAR (Civilian American and European Surface Anthropometry Resource (CAESAR), but it's a project by the airforce lab in the US, between the late 90's and 2002. The idea was to create a new database of body measurements for material design and -- design for outfits for pilots that would be able to fit the very diverse military staff. So what they did was they scanned about 3000 bodies in Italy, The Netherlands and America. They went to different cities with their set-up which was -- and this is how I got to this -- for most of the cities except for a few, they used a scanner called Cyberware. It was a whole-body scanner, and it was supposedly the first whole-body scanner. And Cyberware came out of the entertainment industries, it was the same equipment with which they scanned this 70's the Star Trek character [laughs], supposedly the first 3D scan in animation, so that was interesting. Cyberware came from Hollywood to the military and then once the Cyberware scanner existed, it came back to Hollywood. As far as I know the CAESAR project is still to this day one of the biggest and most diverse databases of scanned bodies or meshes. And because of that it keeps being used and recycled for research. The one I found was for mesh segmentation. The interesting thing there, then again, is that you are not going to use all 3000 scans; you use something like 20 or 15 of the meshes. I don't know how they select these 15, but it is probably supposedly pretty random, I think. Normally doing this sort of research you think there was a grand scheme of how these bodies were selected but it's probably much more like ... "one, two, fifteen". But at the end of the day, this is what the Fuse software is developed with. So this is one reason why I got interested in the CAESAR project. Another thing is that I knew that Cyberware was the first whole-body scanner and I was trying to get footage or a scan from that machine. So through that search I found this video on Youtube that has only 2 likes or less, by a guy called Sandy Ressler. It was this very strange video of a 3D figure that looked scanned, dancing to a very strange song. 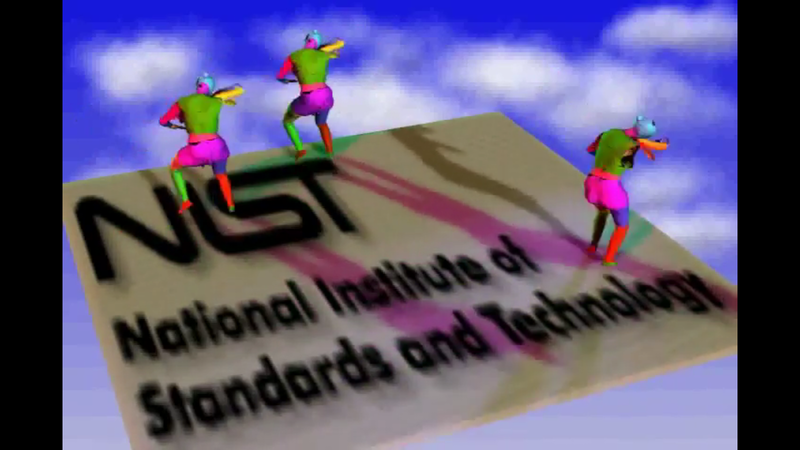 This figure is dancing on the logo of the NIST, the National Institute of Standards of the US. It could have been a net-art piece but no, it was just a random guy that made it. I got in touch with him and at the end we had a Skype interview where all I just wanted to know whether this figure came from the CAESAR project. It turns out that he was one of the technicians on this project so at the end he sent me the file of scan nr. 082 [laughs].